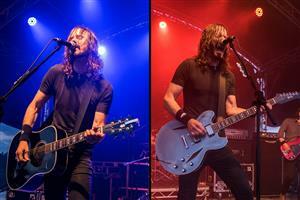 World-Famous tribute band UK Foo Fighters take you on a journey spanning 3 decades of music from this now legendary band Foo Fighters and their charismatic leader, Dave Grohl. This brand new show for theatre; one half acoustic, one half rock (inspired by the Foo’s fifth and only studio double album to date In Your Honor), offers a unique opportunity for fans both old and new, exploring both the melodic acoustic recordings from the Foo's live acoustic album Skin And Bones recorded at the Pantages Theatre in Los Angeles, building to a master class rock stadia experience inspired by Foo Fighters most recent Concrete And Gold World Tour. UK Foo Fighters absolutely nail the true vibe of a Foo's live experience, all performed down to the closest detail making it a truly unmissable show for any rock music fan. Featured in Planet Rock, Rolling Stone, Classic Rock, Kerrang, NME & MOJO magazines. Supporting Harrogate Hospital’s Cardiac Unit & Harrogate Theatre. By way of mutual interest and in collaboration, Jay Apperley (UK Foo Fighters & Speedsta Promotions) and Phil Lowe (Harrogate Theatre) will be donating all profits from this show in support of Harrogate Hospital’s Cardiac Unit and Harrogate Theatre. We’d also like to thank Graham Chalmers (Harrogate Advertiser) for his support. Advance tickets £20, £24 on the door.